Students frequently ask questions like, How do you make grape color? The recipes that follow will give you a start in simulating grapes, brass, leather, and other materials. Keep in mind that these formulas are only starting points. They approximate the color of a typical sample of an object, but not necessarily every example of that object. For example, one grape may be redder than another, or paler, or duller. 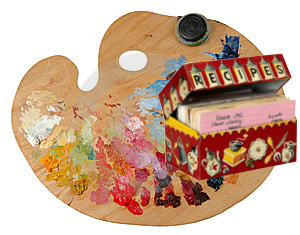 A recipe also doesn't take into account how a color is perceived in the context of a painting. Nor does it consider the effects of the environment surrounding the object being observed as a model, such effects as reflected light, direct light, shadow, and other influences. Also not taken into account are variations in a specific tube color (such as Burnt Sienna) from manufacturer to manufacturer. Still, these recipes provide useful points of departure. A few notes are in order about the colors listed. When white is called for, either Titanium or Lead White may be used. In a few cases, Zinc White is specified, and that should be adhered to. The more reliable Phthalocyanine Blue may be substituted for Prussian blue, and Phthalocyanine Green may replace Prussian Green. It is not expected that you will literally measure out 325 tiny teaspoons of white paint, plus one teaspoon each of Prussian Blue and Alizarin Crimson to simulate a hydrangea flower. In practice, it is more likely that you will squeeze a large blob of white paint onto your palette, and then mix in a little bit of the blue and crimson, adjusting the mixture until it seems right.